Seventeen college students will have their lives changed as they become SN Aboitiz Power-Magat’s (SNAP-Magat) first batch of freshmen scholars under BRIGHTS, its scholarship program. Under the Bridging Gaps in Higher Education through Tertiary Scholarships (BRIGHTS) program, each scholar will receive funding primarily to defray tuition and school fees. The remaining fund can cover the scholars’ living and study expenses such as room and board, books, uniform, and other school-related needs. On the graduation year, the scholar is also entitled to receive partial funding for graduation fees. SNAP-Magat was represented by a team headed by Vitti Valenzuela, Sr. 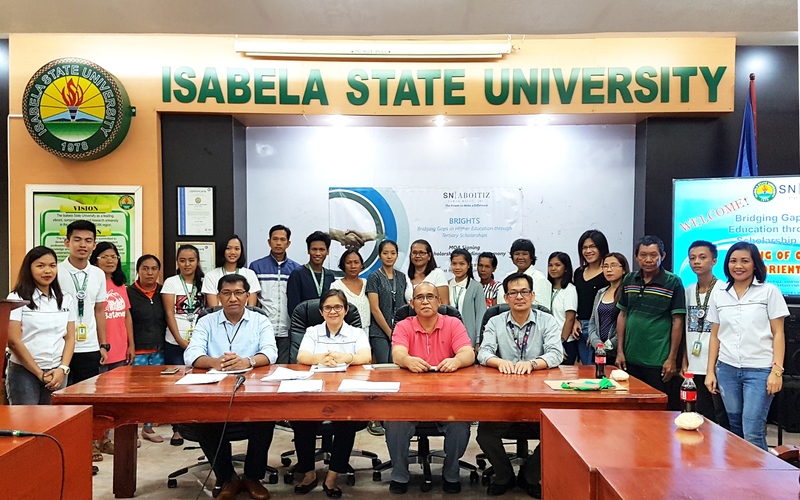 Manager for Corporate Social Responsibility & Sustainability during the orientation and contract signing on October 3, 2018 at the Isabela State University-Main Campus, in Echague, Isabela; Ifugao State University in Potia, Ifugao; and the Northeastern College and Cagayan Valley Computer and Information Technology College, Inc. (CVCITC) in Santiago City. NC and CVCITC are newly-accredited host schools of BRIGHTS in 2018. “We believe that through the BRIGHTS program, we will be able to inspire our students to study hard, reach for their goals for brighter future ahead,” said Dr. William R. Eustaquio, Executive Officer from ISU-Echague. Wesley Aaron Alvarez, a BSBA student from Northeastern College and BRIGHTS scholar, was happy to be part of the program. “I am very grateful to God and to SN Aboitiz Power to be selected as one of the recipients of this scholarship. This is a big help for my family who can barely make ends meet,” he said. BRIGHTS is a scholarship initiative under SNAP’s CSR program. It targets deserving students with limited means from its immediate host communities.